This is usually the slowest time of the year for butchering, but T&E Meats is booked months in advance, like the other small meat processing plants in Virginia. We’re working at almost full capacity to bring locally grown, pasture-raised, and humanely slaughtered quality meats to market. But, right now, our future is looking tenuous due to newly proposed regulations from the USDA. Picture an hourglass and you’ll understand the local, sustainable meat crisis: there are plenty of willing consumers looking for humanely raised, quality local meats, and there are more and more farmers looking to “meat” that consumer demand (sorry – couldn’t help myself! ), but the real bottle neck is processing capacity. Small, community-based meat processing plants have become an endangered species in America, done in by an ocean of super-cheap industrial meat and the challenges and costs of meeting one-size-fits-all regulations. Although species go extinct on earth on a regular basis, every so often there is a major event that comes along and wipes out 40% or 50%. The same happens in the small business world. A few businesses fold every year due to retirement, poor management, and changes in the market, and that is quite normal. But then every so often a catastrophic event comes along that causes a wholesale wipeout. In the small meat businesses in America, catastrophic events result from changes high up in the regulatory food chain that make it very difficult for small plants to adapt. The most recent extinction event occurred at the turn of the millennium when Small and Very Small USDA-inspected slaughter and processing plants were required to adopt the HACCP (Hazard Analysis and Critical Control Point Plan) system. It has been estimated that over 20%, perhaps more, of existing small plants went out of business when HACCP was first instituted. Now, proposed changes to HACCP threaten to take down many of the remaining local plants, making the availability of healthy, local meats a rare commodity. This is ironic given the USDA's new emphasis on promoting local food production. The department's Know Your Farmer Know Your Food Program web site says it wants to "foster the viability and growth of small and mid-size farms and ranches, and we want to create new opportunities for farmers and ranchers by promoting locally produced foods." But the newly proposed regulations from the Food Safety and Inspection Service (FSIS), the inspection arm of the USDA, will reduce local opportunities for ranchers, never mind create new ones. The intent of HACCP is to prevent contamination of meat by harmful pathogens. It does so by instituting well-recognized, established processes and controls set by the USDA itself. At T&E, we have had a HACCP Plan in place since 1999, and it works. We undergo extensive E.Coli testing every year, and have never had a positive sample. But on March 19, the FSIS published a Draft Guidance on HACCP System Validation, outlining new rules which would institute much more intensive testing of all meats, whether or not a problem has been identified. These requirements will cost small plants tens of thousands of dollars, perhaps even hundreds of thousands, every year -- a financial burden appears great enough to force many to shutter. Now, the reason these rules are being proposed is clear: millions of pounds of recalled hamburger, e. coli food poisoning incidents and distrust by consumers and foreign trading partners of U.S. produced meat. But these problems have arisen at plants that handle thousands of animals a day in extremely fast-moving production lines. Small plants operate quite differently. At T&E, for example, we process around 20 animals a day. I know which farmer delivered each animal, often because that same farmer wants his butchered animal back so he can sell it. We're not mixing thousands of animals of unknown provenance into piles of hamburger meat and then sending it all around the country. Perhaps a large plant slaughtering 5,000 animals per day can afford its own lab and microbiology staff, and can pass the cost along to the consumer. And perhaps they should, given the recalls arising from these large-scale facilities. But most small plants can’t handle it. The USDA needs to recognize that "One Size Fits All" inspection no longer works. The risks arising from mega agribusiness plants are far different from community-based plants and they should be regulated appropriately. This does not mean lowering the hurdles for small processors. Rather it means tailoring regulations to the scale and risks of an operation. That way we can provide what the consumer wants – safe AND local food, not just the shrink-wrapped anonymous meat in the supermarket. The USDA is accepting comments on this matter until June 19th, 2010. The original deadline was April 19. You can learn more at the Association of American Meat Processors web site, or the Niche Meat Processors Assistance Network. Please submit a comment if you care about community-based meat processing and humanely produced meats. Your comments really do matter. Submit your comments to the email address DraftValidationGuideComments@fsis.usda.gov or to the Docket Clerk, USDA, FSIS, Room 2-2127, 5601 Sunnyside Avenue, Beltsville, MD 20705. I wrote a story on local slaughterhouses that ran today in WaPo -- my first story for the food section and one I wondered whether they would take. I mean, how do you write about a slaughterhouses in the food section? These sections generally focus on food, maybe the farms, but slaughterhouses don't usually figure in the mix. So I give editor Joe Yonan credit for seeing the story. I decided to tackle the subject head on, literally, and lead with the slaughter of the animals. After all, that's what I had come to see. It wasn't only important for the article but for me as a meat eater. I felt I should at least be able to at least see the process if I was going to eat the stuff (others go further and actually participate). People have asked how I felt seeing animals slaughtered. I thought I would be slightly sickened by the experience, but I wasn't. The men doing the work were serious and careful. They weren't rushed and the animals met their end quickly. (As Tim Amlaw, director of American Humane Certified, a farm animal welfare program, told me: "It needs to be instantaneous -- that's the most humane.") I found the work fascinating. It isn't easy to turn an animal into meat and there is a true craft to butcher work -- a dying craft actually in this age of automation. HARRISONBURG, VA. -- Huddled in a small pen in the slaughterhouse, the four sheep and two goats were quiet and still. A few men nearby in thick rubber aprons cut away at still-warm carcasses hanging on hooks. "They don't seem to know what's going on," a visitor remarked. "Oh, they know," one of the butchers replied. "They know." Maybe it was that awareness that led the men to work quietly and efficiently, dispatching each animal with a bolt shot to the head, until the last sheep, perhaps realizing that the flock was gone, began to bleat. Then she too fell silent. Read the rest of the item on the WaPo site. Here's a list of local meat sellers in the DC region and Shenandoah Valley. At a panel I moderated yesterday for Woman Chefs and Restaurateurs, Jim Crawford, an organic vegetable farmer in south-central Pennsylvania, made an interesting point. He said growing crops organically did not add to cost on the farm -- what added to cost was location, since smaller eastern farmers have four disadvantages compared with produce farmers on the West Coast. First, economies of scale. Since eastern farmers operate on a smaller scale they cannot match the cost advantages of larger operations. Secondly, labor costs. His costs are higher than on the West Coast, where labor is often outsourced to crews of migrant workers. Third, seasonality. Since the growing season is shorter, he can't get as much productivity out of his land as a California operation producing 10 months or more a year. Fourth, weather. He marveled that one strawberry farmer in California told him it hardly if ever rained during the growing season. A couple of heavy rain storms on Jim's strawberries fields and they might be lost to plant disease. That said, he noted that Tuscarora Organic Growers -- the farm co-op he helped start 20 years ago and which now has over 30-farm members -- was making strides in extending production into the winter months, especially with greens. It's doing nearly $3 million in sales in the mid-Atlantic region. It's fashionable, or maybe just attention-grabbing, to argue that local and organic foods are elitist, the preserve of wealthy shoppers who are willing to dole out wads of bills for a weekly fix of local, sustainable food at the farmers' market. Perhaps if it's repeated enough, we'll actually believe it, and then begin to spin yarns about the vast implications of this highly disturbing trend. James McWilliams takes this simplistic view over at the Times' Freakonomics blog. If good, clean, food is elitist, he argues, then it leaves out the vast majority of shoppers and thus creates a wedge in our communities. So you better watch out! Farmers markets are secretly destroying your neighborhood. In countering this ludicrous assertion, I'd first ask, Where is the evidence that local foods are elitist? You won't find it in McWilliams diatribe. He just assumes it. Sure, I see people who are well-off at the Dupont Circle FreshFarm market in Washington (which is located in a high-income neighborhood). But I also see well-off people buying baby clothes on the Upper East Side of Manhattan. I don't jump to the conclusion that farm-fresh food or baby clothes are only sought by the wealthy. This issue actually came up when I was researching my book Organic Inc. I had the notion firmly imprinted in my head that the typical organic shopper was a 30-something, upper-middle class, Volvo-driving, latte-swilling, yoga babe. But try as I did to find the market-research to support that image, I could not. In fact, the largest and most authoritative study on that issue found that the median income of an organic shopper was right around the national median. The Hartman Group, which studies such things and sells their data in pricey reports to the food industry, has said that income is the least important factor in determining whether someone is an organic shopper or not. Which is why you find penniless college kids eating organic vegan dishes. Now, programs are sprouting that double the value of food stamps at farmers' markets. And guess what? They are quite successful. As it is, ethnically diverse groups are disproportionately represented, Hartman found when studying the organic marketplace. Here's another factlet: one of the largest factors in determining organic food purchases was availability. What looks like a white, upper-middle class trend might simply be a function of availability. Or to flip the notion on its head, do low-income people prefer buying fast food and chips from corner stores, or are those purchases disproportionate because of the lack of alternatives? Access isn't the only issue here, but it is a big one. Take the farmers' market I visited last weekend in Greenpoint Brooklyn. Sure there were a fair amount of white hipsters and young parents with strollers but there were Latino and Eastern European shoppers as well. "It's fresh?" asked one babushka eyeing a plump sourdough loaf. Surveying the crowd, you would be hard-pressed to describe it as upper-middle class. In Washington, D.C., where I live, you see it too at farmers' markets that straddle neighborhoods with diverse income groups, like Eastern Market. This market is not some homogeneous beast as McWilliams assumes -- it's diverse because, it turns out, a lot of people like good, fresh food from farms. Here's the other thing about this community-wilting farmers' market fantasy McWilliams concocts. Local food represents perhaps 2-3% of all food sales (though farmers' markets are sprouting extremely fast and not just in upper-income zip codes). It's so minute it probably has less impact on a community than a public school gardening program. But as farmers' markets continue to grow -- and there is no indication that they won't -- they will likely add to communities simply by being a gathering place, where people can interact, especially as access increases. In short, there is nothing inherently elitist about local food, which is why all effort should be made in increasing access across the income spectrum. But following McWilliams' logic, a superstore would offer more cohesion. They have the lowest prices. Low-income people can afford it. Oh yeah, only one problem. You don't need a lot of other businesses or even a Main Street when a superstore comes to town. You don't even need a lot of farmers. Just a few big ones. So how would a superstore create community cohesion? By spinning it from a fantasy determined solely by price. After so many years in the trenches of the struggle to awaken the nation to the value of reconnecting with producers and the importance of food production, it is totally thrilling to see the USDA champion a valued cause. I agree with Secretary Vilsack that "local and regional food systems" are a powerful leverage point for economic, health, and environmental improvement. With this latest initiative, the People's Garden and the White House Garden, the Secretary and Administration are moving the nation into a new era, which I feel will be seen historically as a renewal and renaissance for American agriculture and rural communities, which have suffered degradation for too long. I heartily applaud the USDA, the Secretary and the President! In the video announcement, Secretary Vilsack did point out that USDA will use "existing programs" to shed light on foodsheds. This is good, but the concept is so divergent from the past trend that we may find soon, that either existing programs will need significant retooling, or that a new, specialized program focused on peri-urban agriculture could be very powerful. But I am open to working with what we currently have, particularly until the next farm bill and given the effort to contain the deficit. The farm bill is the most logical place to reorient resources. I have faith that this Secretary and this Administration will be focused on what is needed to make it work. It’s fantastic. Secretary Vilsack posted a youtube video and invited the American people to join him in a conversation about food and the role it plays in our lives. That’s extraordinary. When he first joined the department he said USDA was the people’s department because it was the entity focused on food - something that is so sacrosanct to us all. 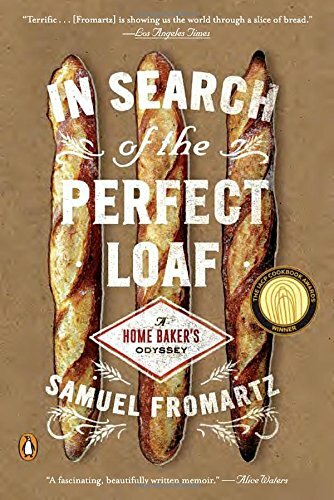 He drew a subtle but important distinction and reminded us all that agriculture, while perhaps a secondary and nebulous thought to most, is what give us something we’re all intimately familiar with, food. Turns out he meant it. I love seeing him invite us to the table, so to speak, to talk about food as if we all have a vested interest. We indeed do. And since he’s invited a real conversation, I suspect he’ll get it from both sides. Remember his confirmation hearing when the diminutive remarks were made about organic hobby farmers? This week Vilsack has legitimized “alternative” agriculture and I suspect will only continue to do so. The funding announcements are also interesting. So far it looks like repackaging of old programs, which is great because, again, it elevates alternative agriculture and legitimizes it within the Department. Brings it out of the shadows, as it were. I’ll be watching too to see new funding streams come on line as well. The latest announcement further reinforces what has been over the past year and half strong interest and engagement on local and regional food from many of the federal USDA agencies I work with. We've had USDA folks at the national level come out to Iowa and interact with our local groups - it is quite encouraging. I think a key to making these resources as effective as possible is the strength of the networks that must be built among the state and regional USDA agency representatives and the non-profits, farm organizations, university, and state departments of agriculture and health. Here in Iowa we have a strong culture of collaboration across these different organizations, and so we are moving forward rapidly to ensure that these resources will be leveraged well with to make the difference with farmers, communities, students, and other groups. It’s certainly refreshing to hear the USDA encourage folks to ‘Know Your Farmer’ – our Buy Fresh Buy Local program in Pennsylvania has been making that call for almost a decade now as part of a nationwide effort led by the FoodRoutes Network – but to back up this slogan with actual bucks? That’s icing on the cake. 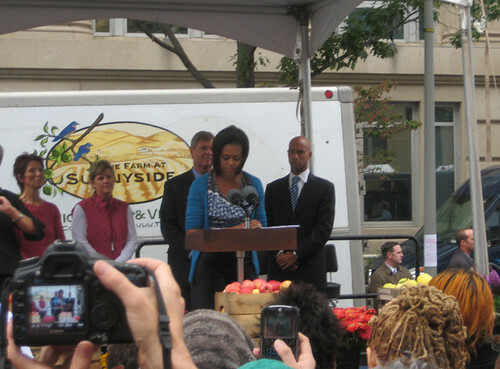 The White House likes healthy, fresh, local food -- that was the message of First Lady Michelle Obama at the opening of the farmers market around the corner from the White House on Thursday. "I have never seen so many people excited about fruits and vegetables," she began. "That's a very good thing." She linked the market to the garden on the White House lawn. "When we decided to plant the White House garden, we thought it would be a way to educate kids about eating more healthy. But the garden has turned out into so much more than we could have expected," she said. "This has been one of the greatest things I've done in my life so far." She also tied it to the health debate now underway. "I realized that little things like the garden can actually play a role in all of these larger discussions," she said. (Full remarks are here). It was a celebratory occasion, punctuated by screams and yelps from the crowd. And then after her remarks, the shopping began as the First Lady strolled over to the Farm at Sunnyside and bought some organic vegetables from my friend Emily Cook, who I knew as a farm intern years ago. 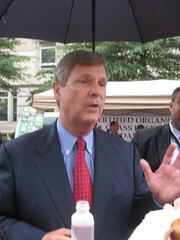 USDA Secretary Vilsack was also on hand, drinking a bottle of organic chocolate milk from the grass fed cows at Clear Spring Creamery in Washington County, Maryland. But the main attraction was the First Lady. Clearly, the White House is interested in this issue. Clearly, they are trying to do something about it. And hopefully, it will move past symbolism and the snarky criticism of columnists who miss the forest for the kale and retread the same old tired ground. A far more subtle and intelligent reading of this entire event -- and an analysis of the First Lady's message -- can be found in this post by Eddie Gehman Kohan of ObamaFoodarama. Grass roots activism started this local foods movement, dramatically expanding farmers' markets around the country, but celebrities and policy makers will push things to the next level. Among them -- Bernadine Prince and Ann Yonkers, who launched the first FreshFarm Markets 12 years ago in DC and made this White House market happen. Farmers markets have come a long way since then and I expect they have a ways to go. I don't usually get calls from the USDA, let alone the deputy secretary, but there Kathleen Merrigan was on the phone from her car and it wasn't a prank. She wanted to talk about the Know Your Farmer, Know Your Food campaign that the USDA launched this week, which centers on building buzz around local and regional food systems and "spurring economic opportunity." Merrigan is chairing the initiative, which comes not a moment too soon. The USDA has finally recognized how important and vital local and regional food systems are -- and is tapping into the vibrant activity already underway by making an effort to open up its doors and purse strings. loosening rules on interstate meat commerce, to help smaller processors, and making grants on rural economic initiatives. making it easier for institutions like schools to buy locally. offering grants to improve community food security, to be announced Wednesday. emphasizing direct marketing, with the launch of the White House farmers' market, and farmers' markets grants on Thursday. pushing the idea that "ag is back" with a new web portal launching Friday and a Facebook web chat with Merrigan. This sounds like a lot of hoopla -- you can review the press materials at the USDA links above -- but I did get a chance to ask a few questions, most notably, "What is this about?" Merrigan said she has been quietly heading a task force since May to push local and regional agricultural initiatives. Representatives from various department programs are meeting biweekly to discuss how best to achieve that goal. Like Obama, Merrigan and her team seem impatient about getting things done. "The secretary told me he wanted me to take on the local and regional food challenge -- it was a top priority of my job aside from the USDA budget," Merrigan said. "And, I'll always be involved in organic." Given the size of the USDA - 114,000 employees - Merrigan felt it wasn't imperative to create new programs but to increase outreach to existing ones (and perhaps, though unstated, light a fire within the agency on this new priority). The effort also involves tweaking existing regulations and programs to make these goals easier to achieve. The initiative even extends to the USDA cafeteria, where your intrepid blogger has actually eaten (I recommend the House Cafeteria up on the Hill instead). In any case, the USDA is offering dishes with locally grown products all week long. Merrigan said the cafeteria is also banning donuts and fried foods on Wednesday and putting a sign on the soda machine "have you considered water, juice or milk?" Sounds almost radical. "Maybe this will be my last act as deputy," she quipped. But if staff groan about food police, at least they get to see a celebrity on hand: White House Chef Sam Kass will be doing a cooking demo in the USDA cafeteria on Wednesday. On Thursday, the action shifts to farmers markets, when the one down the street from the White House opens. Merrigan will be on hand. The USDA will also announce a series of farmers' market promotion grants, and research monies aimed at local food systems in the northeast. Finally, on Friday, it is trying its hand at internet democracy and launching a web site that includes outreach to citizens for their ideas. Not sure how this effort at crowd-sourcing will work out, given what happened when the White House tried it. But I gotta say, this is a sea change from the last team in charge. Is Organic and Local "so 2008"? Organic and Local is so 2008—or at least that’s the case that journalist and “The End of Food” author Paul Roberts makes in Mother Jones this month. The gist of his argument: because the food system’s problems are so deep, the food movement needs to mature beyond its one-dimensional, at times robotic devotion to Organic and Local and instead adopt a broader range of solutions. He offers the example of Fred Fleming, a noted Washington wheat farmer whose masterful no-till system has greatly reduced erosion from his land. Fleming remains outside the foodie circle because his system depends on using herbicide, but Roberts argues that he is just the sort of farmer we should be embracing. Roberts does make an important point: agriculture faces many more issues than whether or not farmers use pesticides; to boot, all of those issues are currently being compounded by climate change. Wes Jackson of the Land Institute recently made a related point underscoring the threat we face from soil erosion. He argues that the most damaging climate-change-related weather events we’re seeing are not hurricanes hitting the Eastern seaboard, but heavy rainfall and floods in the Midwest. In Jackson’s view, even the destruction wreaked by Katrina did not compare to the long-term loss we suffer from having millions of tons of farmland topsoil washed away in floods, as happened last March and April. I can imagine Roberts chiming in to say that if using some Roundup would hold that soil in place, the tradeoff would be worthwhile. It’s hard to disagree with that. But after hearing Roberts make his case live at Organicology in February, I would argue that he’s too near-sighted with his remedy. Rather than embrace farmers’ lesser-of-many-evils practices within the existing system, we need to overhaul the system itself. As it is, farmers are expected to be purely economic beings that fit into the free market alongside mortgage securities; the true solution instead lies in seeing them as the ecological caretakers we so desperately need them to be. Think of it roughly like the National Parks: Years ago, we as a nation recognized the need for large areas of land to be taken out of the real estate market for the express purpose of maintaining them according to a different set of priorities; we saw that wild lands served the public good, and that not protecting them was to our detriment. Well, now we’ve reached the same situation with our working lands, as the constant pressure of the market system has led them to a threatened existence. I’m not suggesting we buy up farmland and make it government property, but rather that we recognize farmers and ranchers as a kind of public servant. To begin with, replace the Farm Bill’s provisions for subsidies and incentives for commodity production with a true support system of financing, education, and farmer-centered research and market development; that could enable growers to switch their focus from bank notices to caring for their lands long-term. In time, probably most would gravitate to ecological methods such as the organic no-till farming system that Rodale has been developing for the past decade. Some, though, might choose herbicide-dependent no-till as the suture that would hold their land in place. In that lies the greatest challenge of supporting farmers: trusting that given the proper tools, they know and will do what’s best for the land. I believe that trust is where Roberts’ argument was leading, even if it didn’t quite reach that conclusion in the MoJo article. If so, it’s a step in the right direction. Northern California-based writer/photographer Lisa M. Hamilton focuses on food and agriculture. Her book "Deeply Rooted: Unconventional Farmers in the Age of Agribusiness" (Counterpoint) comes out in May. I was on the mall in D.C. yesterday, in the frigid temperatures, in the packed crowds, with a five-year-old on my shoulders getting a glimpse of a historic moment. When I asked my daughter today what she thought about the inauguration, she said: "music, music, speaking, speaking, flags wave, yeah Obama!" And that about sums up what happened. But then, I also recall the men and women crying nearby, mostly African American, the laughter when the MC said, "now you may be seated" (we had been standing for about 2 or 3 hours by then and would continue to stand); the tidal wave of cheers when Obama first appeared on the giant TV screen; the boos at Cheney and Bush; and the loud, "yes!" and "you're right!" during Obama's inaugural remarks. 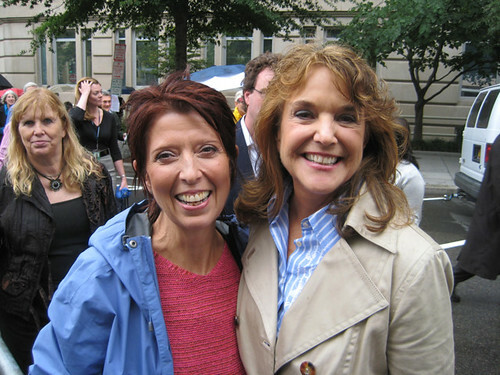 So yes, it was a historic occasion, unlike anything I can recall, having lived in DC for more than a decade now, and having come down here as a child to participate in very different kinds of gatherings on the mall - the peace demonstrations during the Vietnam War. This was far bigger, far more moving, far more inviting than anything I've seen and it literally turned our town upside down. We live 2 blocks from the Capitol dome, our street the first one outside the security perimeter, which meant that buses were chugging down our block all Monday night. I woke up at 5 a.m. and looked out the window to see streams of people already heading down to the mall. We let the kids sleep in, so didn't forge out into the crowds until about 8:30 and by then it was like Time Square in NYC, but with the gridlock of packed crowds on many blocks. It took over an hour to get to a place I jog to in 10 minutes on any other day. The air was also festive, people smiling at each other, saying hello to total strangers. I was humbled by the fact that I just had blocks to walk while others traveled all night to get here and in some cases didn't make it onto the mall. In fact, early on, we were locked out of the mall by police barriers, until by a stroke of good luck we passed by the gates of the Smithsonian Castle garden just as they were unlocked. 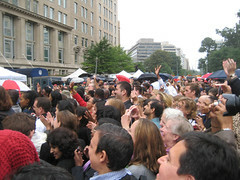 A stream of people passed through and filled up the spaces on the mall. We were among them, rushing to witness the moment before it passed. Then we stood, sipping hot cider we had brought, listening to the remarks all of you have now heard, cheering and feeling the emotion rip through the crowd as Obama took his oath of office. We could only see it on the Jumbotron, but it wasn't what you saw so much as what you felt. A sense really of being humbled by so many people feeling exactly the same thing no matter where they came from, no matter who they were. Even my 81 year old mother, watching it on TV back at my house, said she had never seen anything like it -- not even when JFK was inaugurated. On Sunday we had also stood through the entire concert at the Lincoln Memorial, watched my peers in the crowd sing along with Garth Brooks on "Bye Bye Miss American Pie" (while younger folks looked on somewhat clueless), sang along again with Pete Seeger, his grandson and Bruce Springsteen on "This Land is Your Land," (my daughter joining in, having learned the words in school). We just wanted her to remember, to say years later that she was there, making history. Recently on the way back from the mailbox to retrieve the newspaper, I was struck by the headline: "Bad Trend." It seemed like the 30th bad news headline in a row: "A Fight for Survival." "Some Shoppers Go Without." "Financial Genius on Verge of Disaster." It was the last straw. It's time someone heard some good news! The local food business is thriving -- despite the "real economy." Demand for locally produced food is far outstripping supply. In my 30 years farming and marketing locally, this was our best year ever. More telling is that there has been no big "bubble" but just steady growth over that entire time. And throughout this fall there was a steady drumbeat -- like never before -- from those wishing to buy our local produce next season. I hear from other farmers around the state and other regions the very same thing. What is making it thrive are some fundamental factors. Certainly these would lead one to think the boom isn't some flash-in-the-pan phenomenon but a truly sustainable movement. It all starts with a geometrically increasing consumer base which "gets it" -- that real food from local sources can, and does, promote health. That spending those food dollars for local foods promotes many things most of us want -- the freshest things the earth can provide for our table at a reasonable price; the comfort of knowing where our food has come from and how it was produced, i.e. transparency and trust; and beautiful agricultural landscapes in one's vicinity. Locally produced food does all these things while tasting so ... good. Observing firsthand the connection between our physical world and our own sustenance, i.e. having farms nearby, gives citizens a sense of peace, security and well-being. The practice of agriculture models characteristics in the human spirit that are worth encouraging -- hard work, honesty, connectedness, thrift, adaptability, inventiveness, recognition of the divine, artistry in the aesthetics of place and responsibility. Yes, we can try to teach these things to our children in our educational institutions, but immersion is always the best teaching method. Farming exerts far more influence on the quality of our lives than even mere dollars would suggest. People are rediscovering this and the fact they value it is attested by this explosion of local food sales. Agriculture is well-known for recycling dollars many times over as they percolate through the local economy. According to a Penn State University study, farms exact less in terms of municipal services per dollar of tax collected than any other type of land use. Using Ross Perot's words, local farms don't create a "giant sucking sound" of jobs leaving the country, but just the reverse. Now, I said earlier that this local food is provided at a "reasonable" price. This is not the same as food provided inexpensively. The willingness of the consuming public to pay a fair price for food reflects a fundamental change. They see nutritious food is actually a bargain when compared with purchasing cheap food which is deleterious to health, or food which is shipped astronomical distances incurring hidden costs of environmental degradation and energy dependency. Several factors can impede this unfolding ag revolution and opportunity. One is the loss of local, small-scale food processing facilities -- slaughterhouses and butcher shops, particularly. And the other is the loss of young people to enter the field (no pun intended) who've had the experience of growing up on farms. The first might be addressed with revamping inspection regulations and would be an excellent place to spend some of those federal infrastructure dollars. Both impediments will be addressed as talent is drawn to the good agricultural and ag infrastructure opportunities. Maybe that other economy could take some lessons from the simple economics of good old-fashioned horse sense. I'm always amazed how deep the real pockets of our diversified Pennsylvania farmers are. It's not paper wealth that has been created but the durable hard capital of topsoil, woodlots, cattle, orchards, fences, barns and machinery. It's pretty typical of these farmers not to live beyond their means, to be adverse to borrowing, to take responsibility, to see beyond rhetoric and schemes too good to be true, and rather than expecting a free lunch, they provide it. Instead of spending their grandchildren's inheritance, they build it. The "real" economy seems to have forgotten these basic lessons. Don Kretschmann is an organic farmer from New Sewickley Township in Beaver County, Pennsylvania. He serves on board of directors of Pennsylvania Association for Sustainable Agriculture. This article first appeared in the Pittsburgh Post-Gazette. One of the more fascinating things about working as a meat processor for a large number of small farmers is the diversity of their livestock. I never quite know what to expect from day to day. On New Years’ Eve alone we had heritage Gulf Coast and Highland Cheviot sheep; Berkshire, Duroc, and Tamworth hogs; and Black and Red Angus cattle. One Gulf Coaster was a large ram with an excellent curling rack of horns, which his owner had us save for his sons. I completely understand that sentiment: visitors to my home are met at the end of the driveway by a large bony skull with great down sweeping horns, placed strategically where it can scare the bejesus out of unsuspecting guests when the glare of their headlights catches the thing on a dark night. The skull is what remained of a small group of Scottish Highland cattle that passed through the T&E plant. Queen of Spades lifted her tail and had a pee. I watched as Gingerbread Boogie tasted her urine, sticking his tongue in the stream, then curling his lips back and inhaling deeply to catch the fine aromas, like a wine aficionado with a premier cru Burgundy. Bulls do this to see if the cow is coming into heat. Here he was in the abattoir, and he was enthusiastically thinking of one last fling. I admired his spirit. We ran the kill floor the following day when I was away at a meeting. I called in for a progress report, and my staff told me that things hadn’t gone well. Gingerbread Boogie’s horns were too long to make it up the lane into the knock box, so they had called his owner to come take them back home. I can’t say I was sorry to hear that they were back on pasture. We have work to do, but we admire the animals and their beauty too. Joe Cloud is a partner in True & Essential Meats, a small slaughterhouse in Harrisonburg, Va.